Fintech, or financial technology, has evolved from a series of fledgling businesses with a nascent industry with over $20 billion in venture capital investment in the past 5 years. 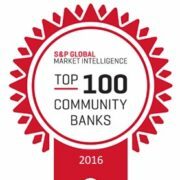 Fintech companies are now working with more than 70% of local community banks in mobile banking applications. With a banker’s view of the current low interest rate environment, expense control is paramount for high-performance banks. Fintech is helping banks lower their cost of operations while adding new services. Community banks lend to nearly 50% of small-business owners in the U.S. To this large base of clients they offer unique, highly personalized services. For today’s business managers and owners, fintech accomplishes many of these services faster and at lower costs. Given this environment, we are currently evaluating several new partnerships for local banks. Community banks’ strong experience with regulators and favorable regulatory standing will be important to their partners. Many banks are helping their finteh partners through the current maze of regulation and compliance. We are facilitating multiple fintech groups seeking regulatory guidance in starting or buying banks. Our view is simple. Both fintech and community banking industry will be more profitable with these current and future partnerships playing a significant role. Edward Carpenter and Jack Wielebinski – as seen in the November 7, 2016 Orange County Business Journal’s Q&A on Fintech & Banking.